The PT678HBA is one of our flagship home theater systems — a 400-watt, 5.1-channel amplifier and pre-amp, equipped with the latest technologies: Bluetooth audio playback and HDMI video for compatibility with the newest Blu-ray players, video game systems, and flat-screen televisions. You get four satellite speakers plus a center channel and a subwoofer for a full, rich experience that envelopes you in sound as you watch your favorite dramatic TV shows, films, and sporting events. Stream audio from apps on modern smartphones with Bluetooth compatibility, including iPhone, iPad, Android, and BlackBerry. And connect your modern HDMI devices for HDMI pass-through with 3D compatibility — the receiver can also act as a video selector if your television has limited HDMI inputs. The satellite speakers pack 50 watts each, while the subwoofer has a whole 150 watts of power with a 10' long throw driver for deep, booming bass. 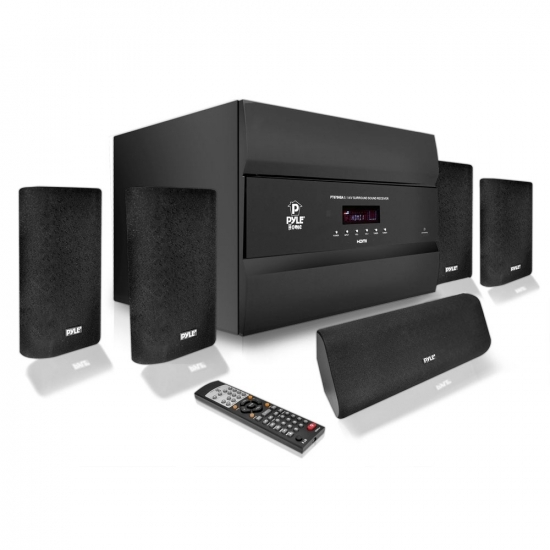 This home theater system is compatible with virtually any device equipped with stereo RCA output. Gold-capped A/V cables and wires ensure a high-quality, distortion-free connection between the home theater receiver and your audio-visual equipment. Control it all, including EQ settings, using the buttons on the front of the receiver, or using the included wireless remote control.